Do you often overthink or second-guess your decisions, or find yourself making decisions that lead you down the wrong path? Every day, you face dozens of decisions that will ultimately effect the future of your business. Confident decision-making is essential not only to your success, but to your mental health; questioning all your choices can become a major source of anxiety and stress. So what's the secret to making more confident decisions? It starts with knowing your core values and the strategic priorities that drive your business forward. 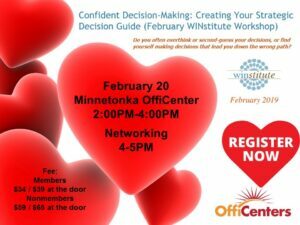 Discover how you can make smarter, more confident decisions with the personalized Strategic Decision Guide tool you'll create at this hands-on workshop. You'll explore the values, financial goals, and other motivating factors that form a unique vision of success for your business. Based on these key priorities, you'll create your own Strategic Decision Guide to support you in making the decisions that will lead you to the success you've envisioned - with less detours along the way! You'll leave with a powerful, personalized decision-making tool you can put to use right away. Attendees are also invited to stick around afterward (4-5pm) for an informal networking reception with complimentary light refreshments, including beer and non-alcoholic beverages.